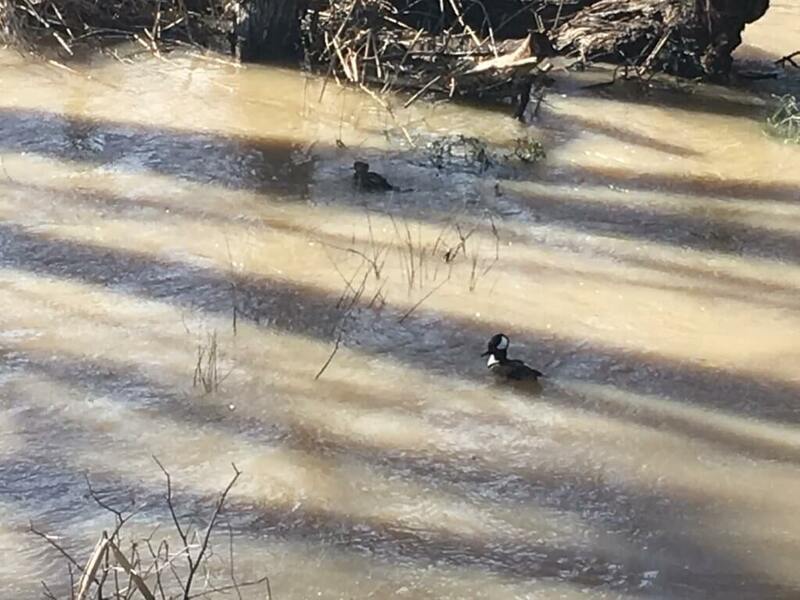 Birds At an Aquatic Habitat: What Changes Could You See After Storms? 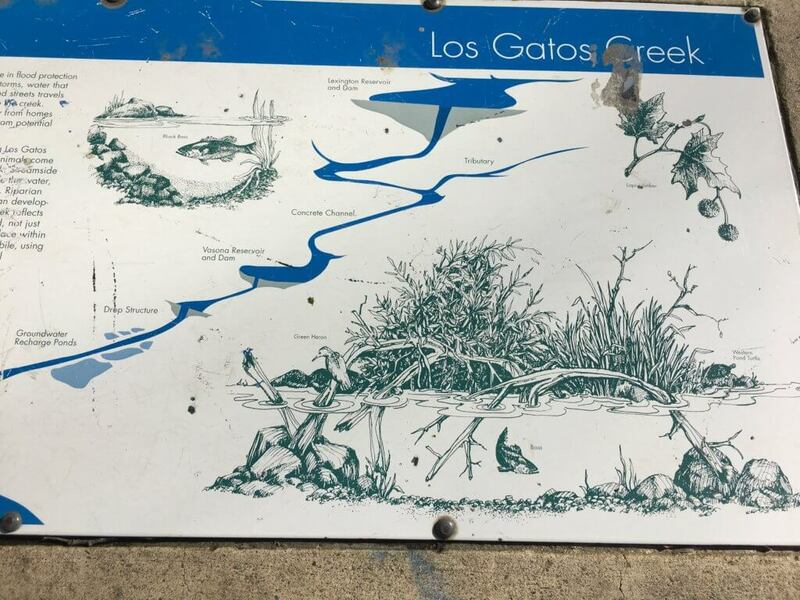 In Santa Clara county where the Silicon Valley is located, Los Gatos Creek is one of the few urban streams that remains relatively intact throughout countless developments in the area during the last 200 years. 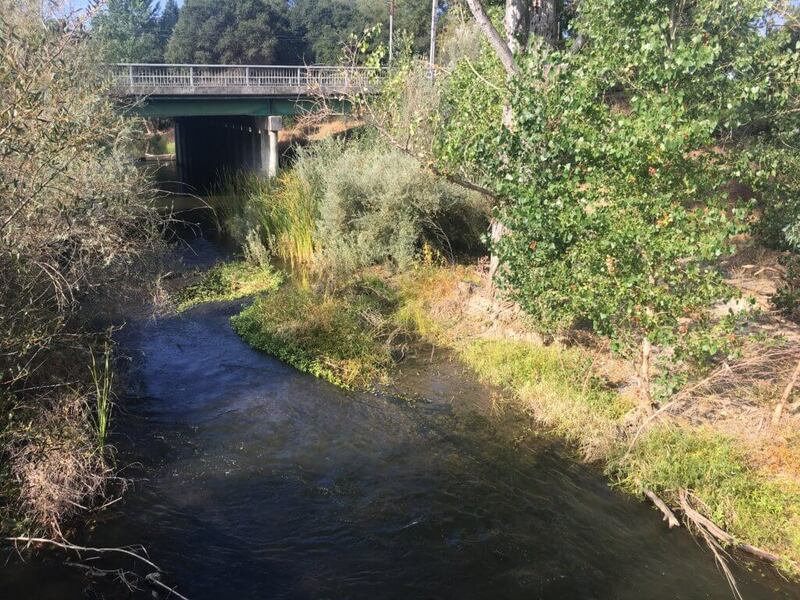 The stream originates in the Santa Cruz Mountains, flows into the Vasona Reservoir, winds through a small valley, and clears into the Guadalupe river that finally empties into the San Francisco Bay. It is one of the many steams and creeks in the vast Guadalupe River watershed, and a habitat for many wetland species. 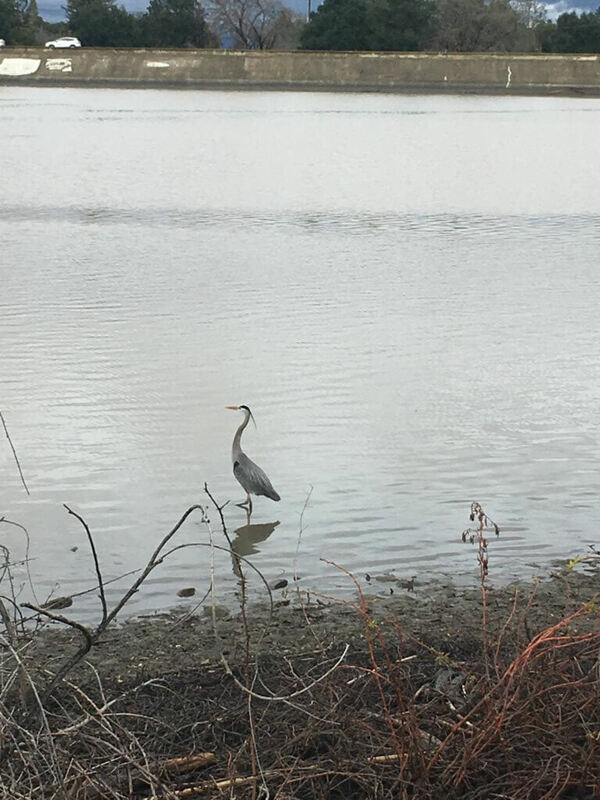 Watersheds are critical habitats for birds, fishes and other animals that live a wetland environment. 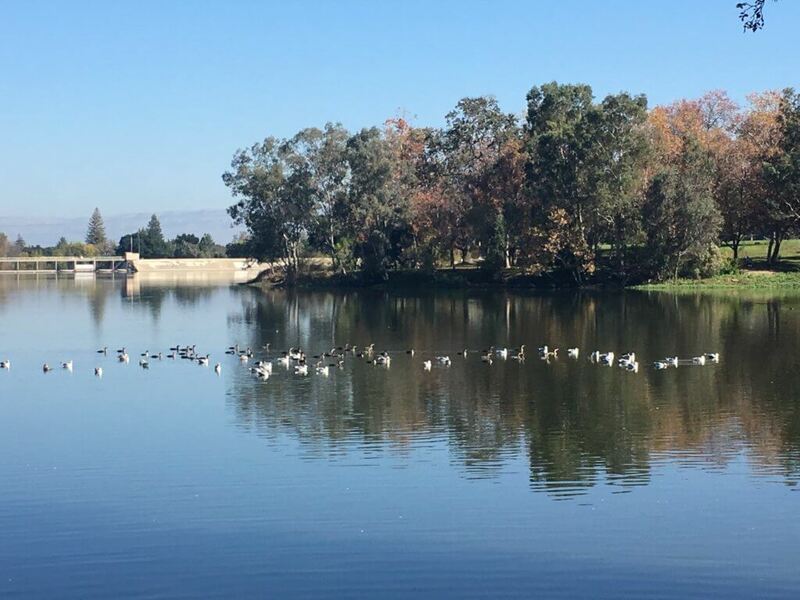 200 years ago, before any of the modern developments, the creek must have been a heaven for the birds and fishes. At the time, all kinds of birds could be seen flying in the sky and resting in the creek; fishes swimming through the creek in massive numbers. 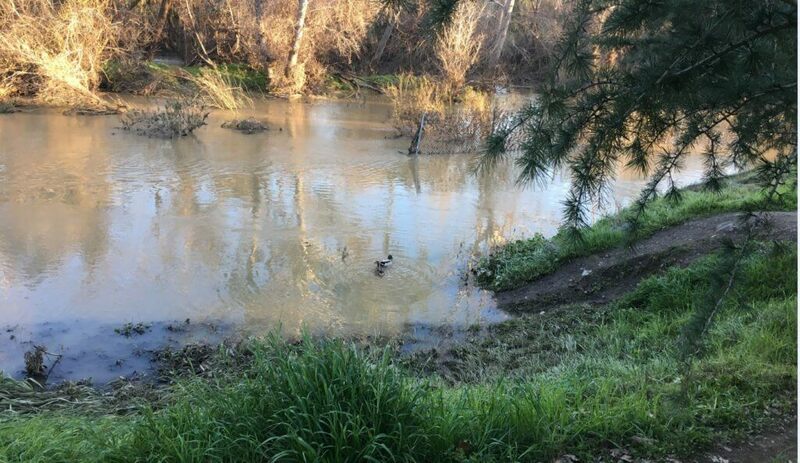 Unfortunately, in the 200 years since, “about 90% of California’s original aquatic habitat has been altered or destroyed through human activities”, more than any other states in the nation. 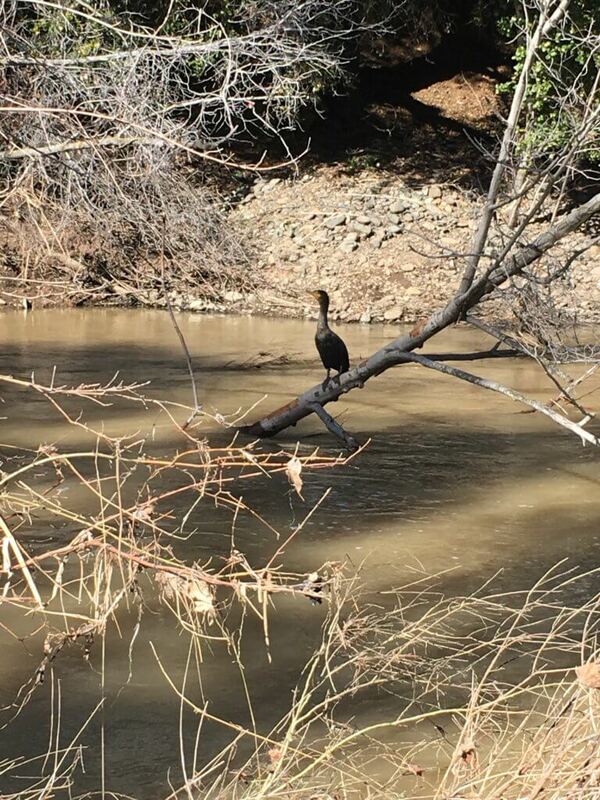 What we see in Los Gatos Creek today is one of the 10% that remains. 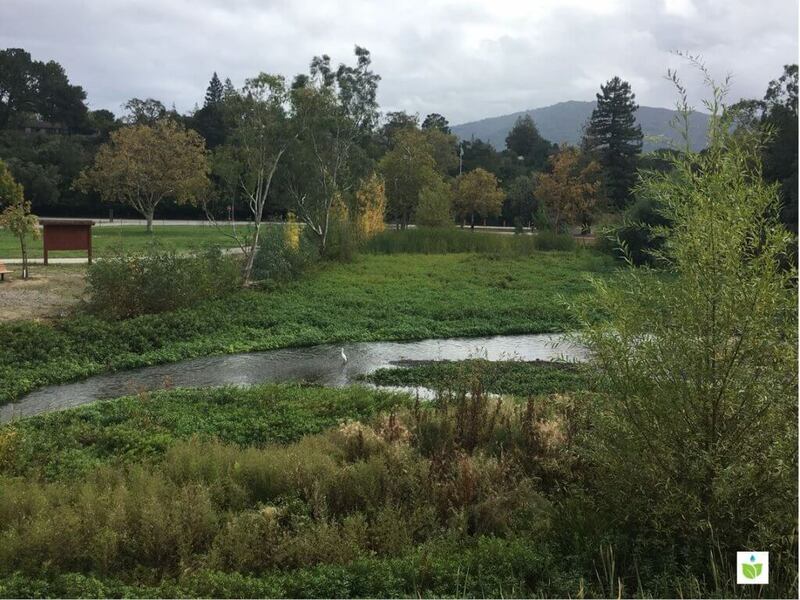 Today many of the parks like Los Gatos Creek often provides the only refuge in urban areas for native wetland species. They have been living here for tens of thousands of years. During migration season some species of birds will also come and use the place as a resting area, critical for their survival. If the park no longer exists, or its environment dramatically changes, it can be devastating for all the birds that have been depending on it for so many years. The birds that can be seen most often are Canadian goose. 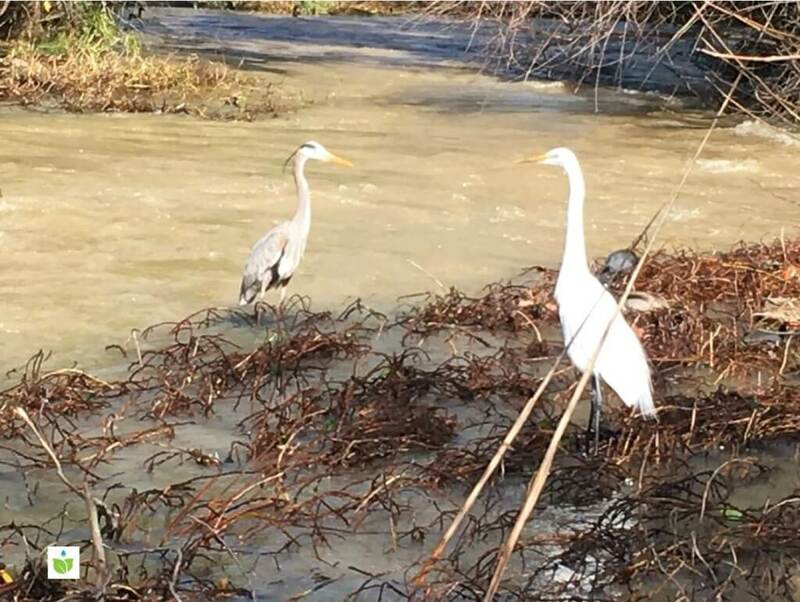 Great egret and snowy egret can also be seen from time to time. This was in the migration season of November. These birds were taking a rest before they flew out to their next destination. After an epic, historic 5 year drought, starting from late fall of 2016, California went from extremely dry to extremely wet, with record breaking rainfalls. 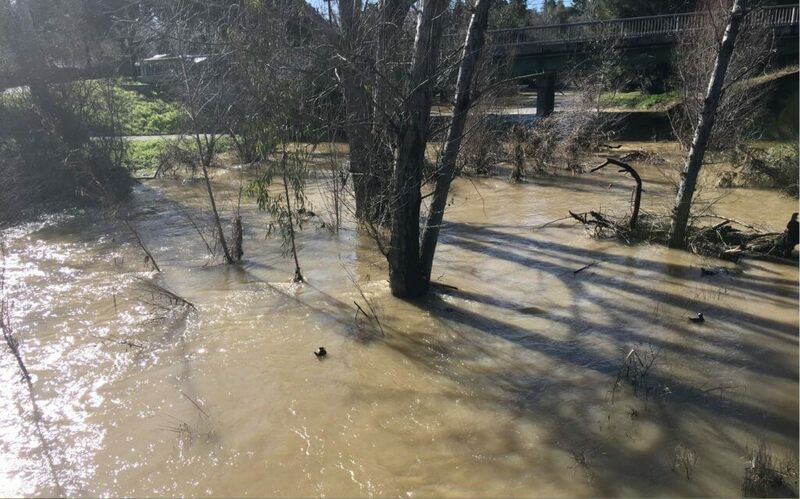 Heavy rains pummeled from late fall all the way into spring, in some places floods and mudslides occurred. 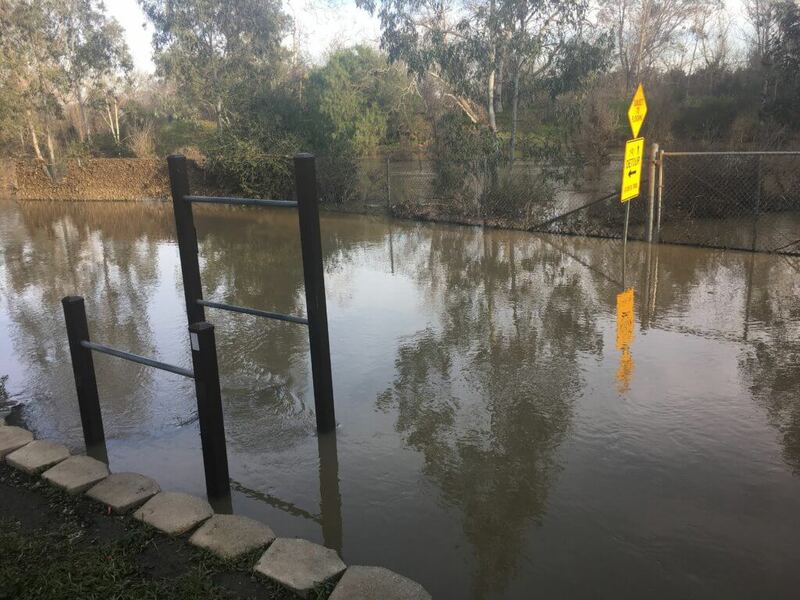 At Los Gatos creek, parts of the trail were also flooded several times. The new “stream” in the previous trail was quickly discovered by some lovely “guests”. They came in swiftly, playing in this new playground of theirs, relaxing, fishing and enjoying a good meal! Same as these ducks, quite some birds found out the new water and came right in. Here is normally what you would see when you cross a bridge to enter the trail and look down at the water . The right side of the creek bed is completely dry. On the morning after several heavy storms in January, though, the whole span of the creek bed was fully filled with flood water. On the muddy yellow water you could see these two little birds, guests that were not seen here before. After you walked a bit more along the trail, there was another surprise waiting. 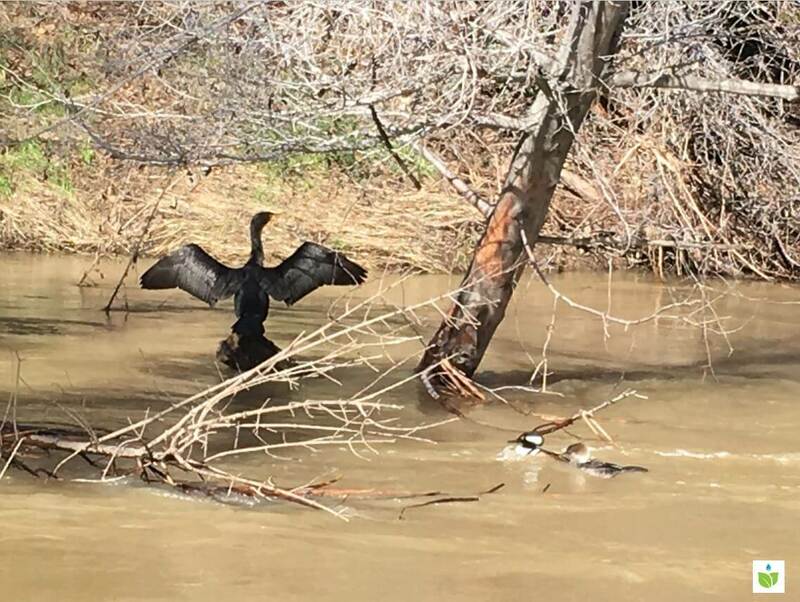 A Double Crested Cormorant was “relaxing” on a tree, which was never seen here either. She streatched her wings, turning her head from left to right, right to left, then left to right….with the kind of excitement of a baby. 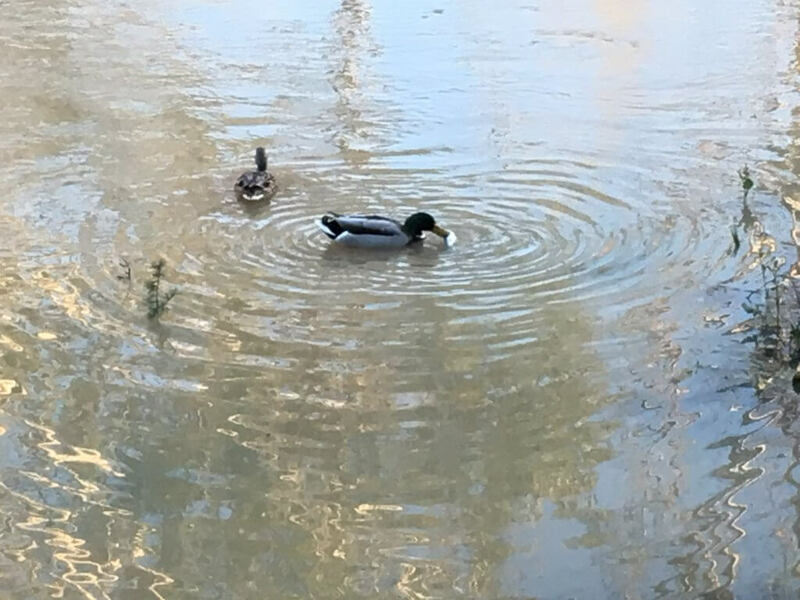 In the second photo, the two small birds could also be seen swimming in the same place. 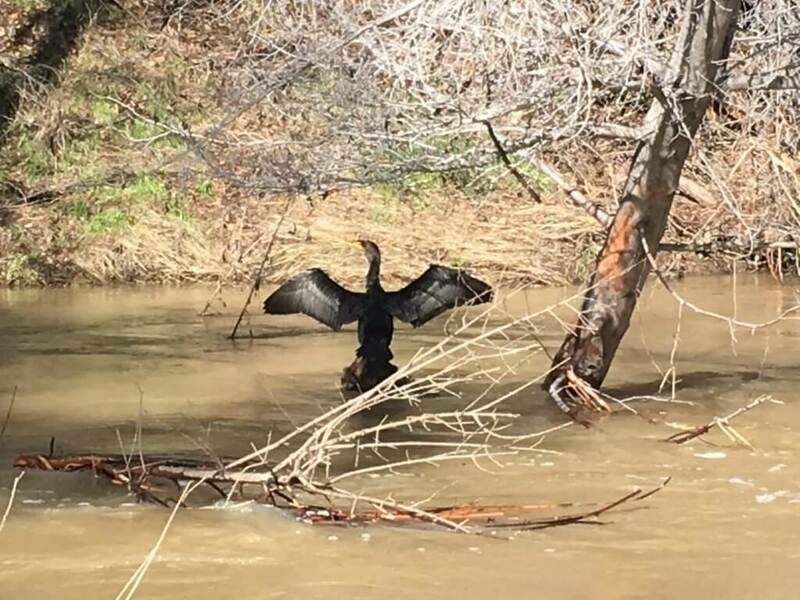 The cormorant really liked it here. 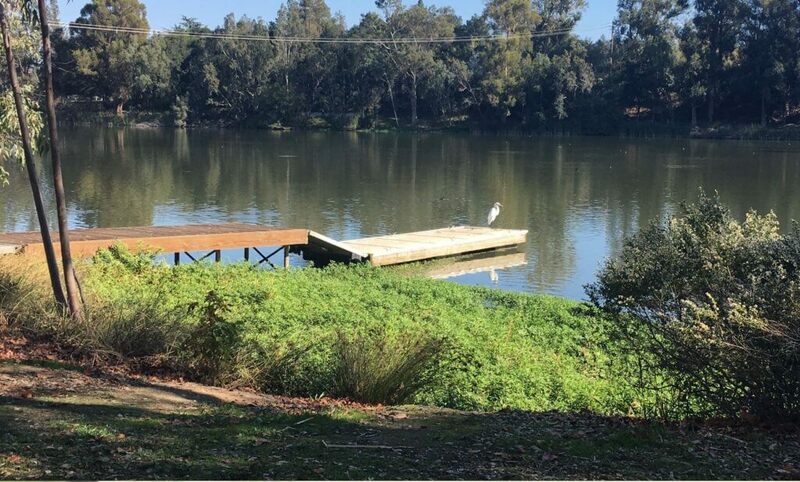 In the next 2-3 weeks you can see her swimming, resting and relaxing in this particular spot. Even more surprises ahead. After you went further down the creek and came to this spot – Look! literally a bird’s paradise. So many birds, of different species, gathered here, rested in this comfy patch made from branches and grasses brought by the flood water. 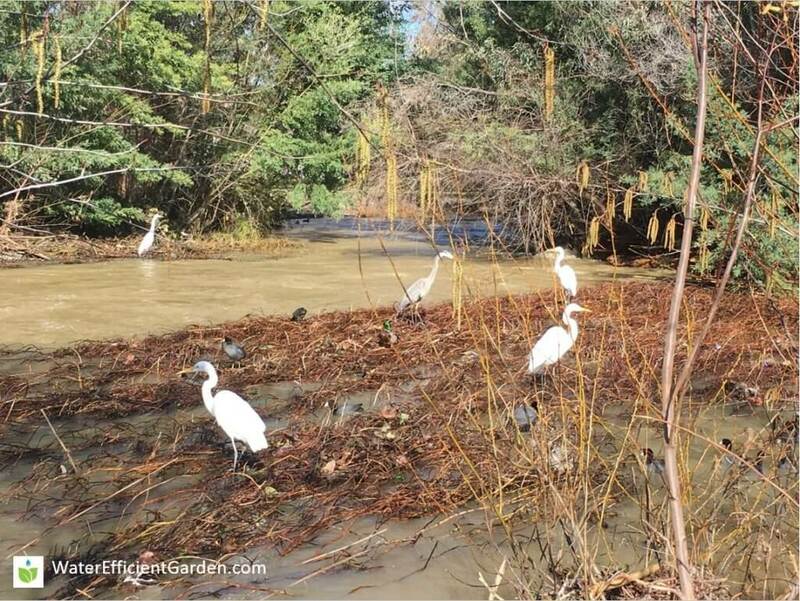 The patch was right in the middle of the creek, providing the birds all they needed: food, shelter, and a fun place to hang out. After just one day, though, the patch was gone, so went all the birds. Such a view was not seen again. 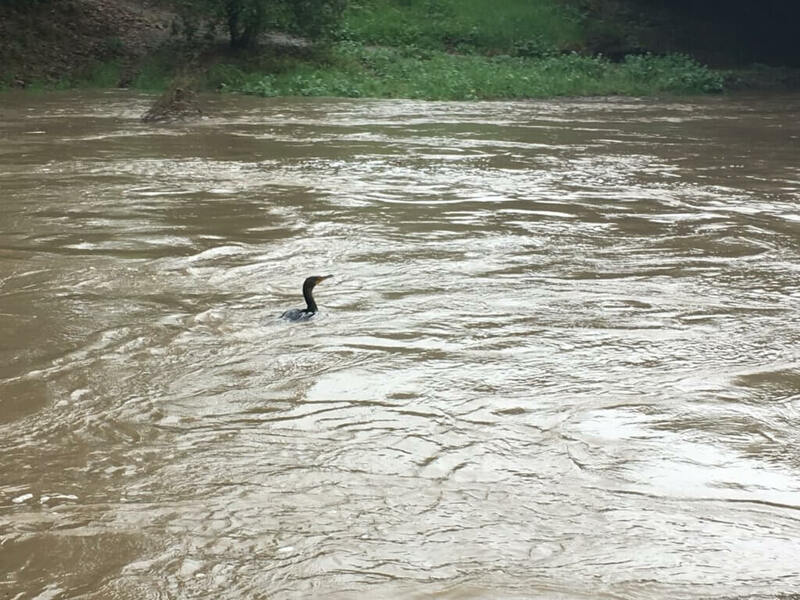 In the next 2-3 weeks when it continued to rain hard, more birds usually unseen could be found at the creek. 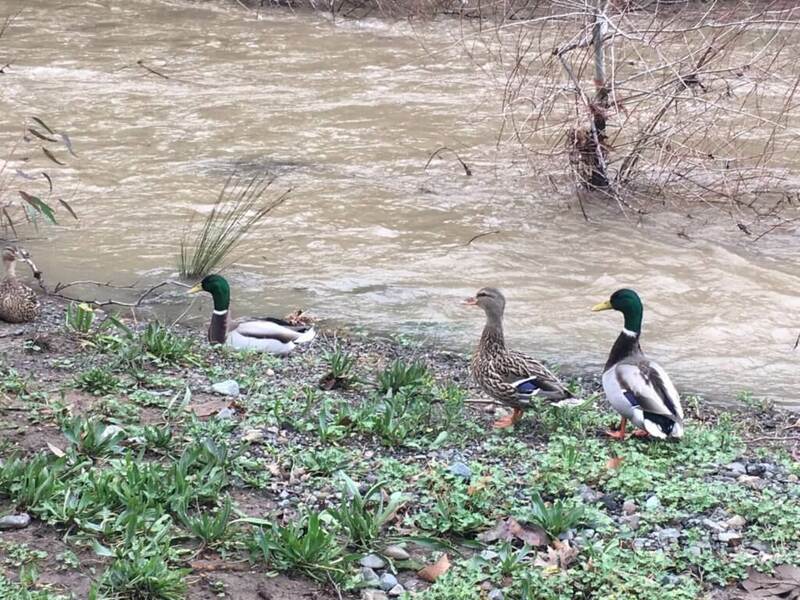 2 couples of the mallard duck. Look at that beautiful blue stripe. 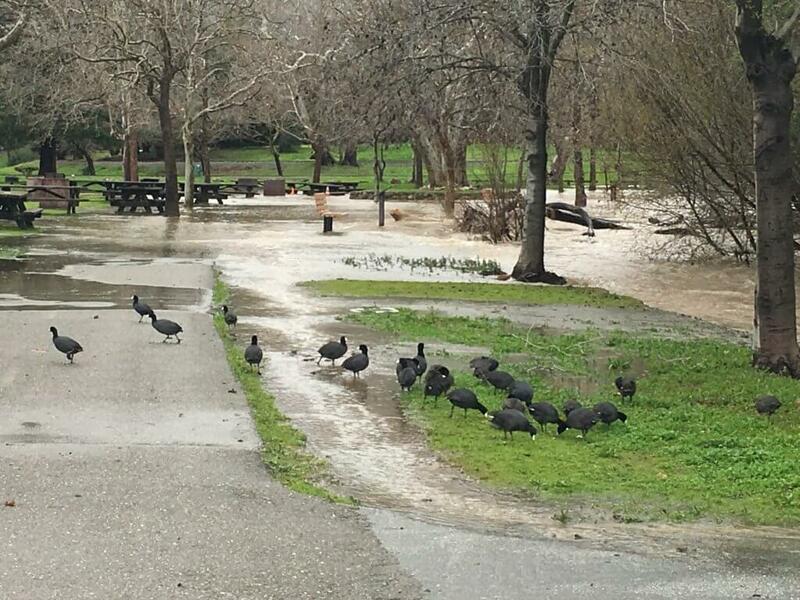 A big group of the American coot, on the flooded trail. While coots can be seen often, such a big group was only seen during this time. A big bird was seen here at the tree right beside the trail, towards the end of the rainy season. She really enjoyed the tree and stayed on it for hours, ignoring all the people who passed by on the trail. She was seen only once. 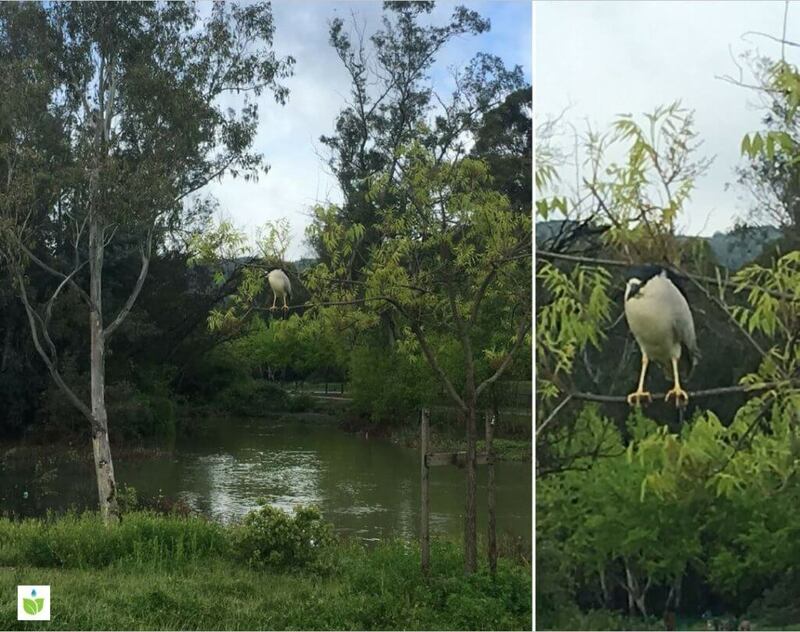 This is a black-crowned night-heron. 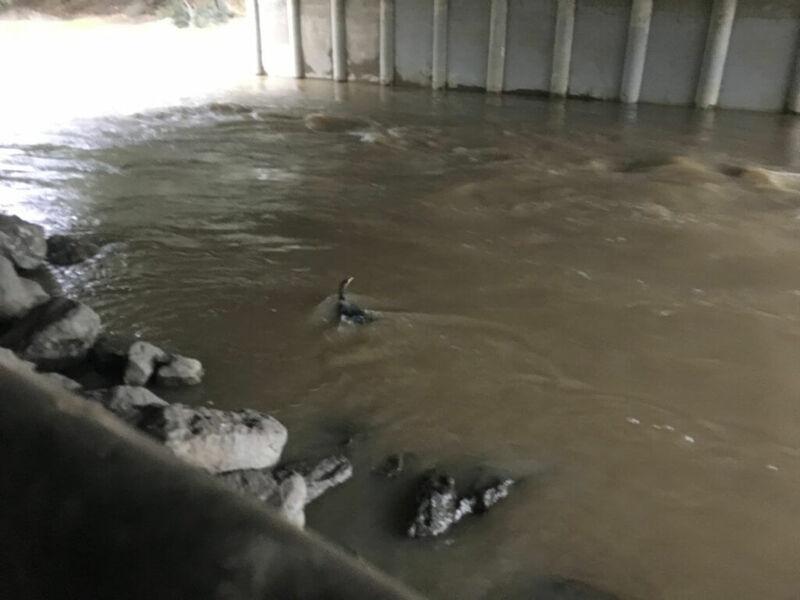 The heavy rains at Los Gatos Creek gave us a valuable opportunity to observe how a sudden increased level of water would mean for the creek habitat, and the ecosystem. If we just look at the birds, the answer is clear: they loved all that water. While we don’t have a count for the birds’ numbers during the storm time, the number of species, and the size of the bird groups we saw, increased quite significantly. This happened with just 2 months of storms, one could only imagine how it would turn out if the same rains continued for a longer time. Water will just become more scare in the future, relative to our demand for it, with population growth, economic expansion, and climate change. 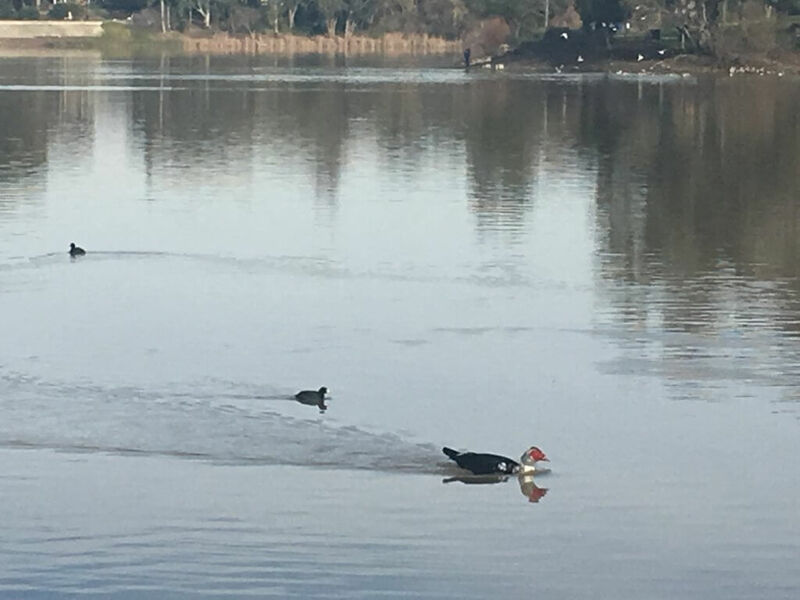 How can we manage and use it , so that we not only will have enough for ourselves, but also for the birds and fishes in the aquatic and reparian habitats? While all kinds of solutions are being explored, one thing is clear: we must continue to conserve water, which is the easiest and cheapest solution among all. 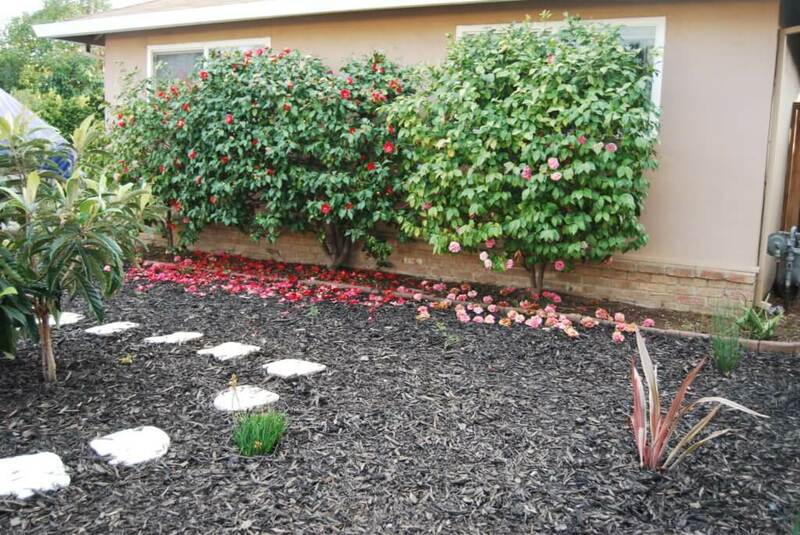 In California, we use half of our water in outdoor landscaping. If we can all switch to water efficient gardening, we can surely save a significant amount of water. 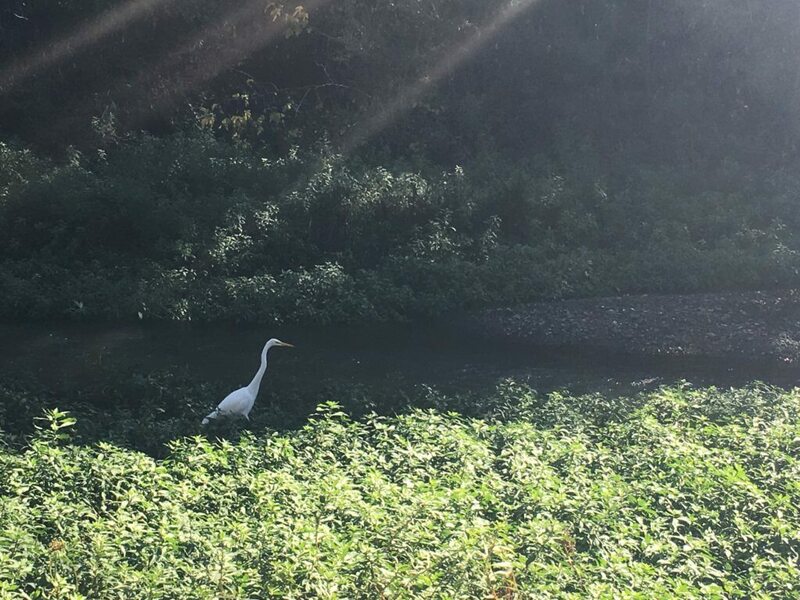 As we see in the picture, when we save water with drought tolerant plants like these Mexican bush sages, we no only save for us, but also those birds in the creek. 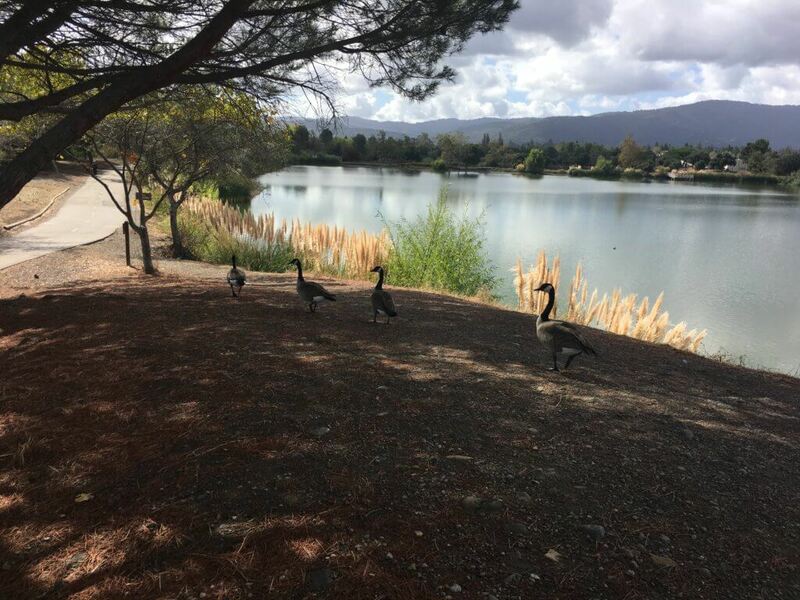 Author [email protected]Posted on September 14, 2017 September 22, 2017 Categories Biodiversity, Rain GardenTags aquatic habitat, birds, drought, drought tolerant, ecosystem, garden, habitat, native plant, riparian habitat, save water, storms, water conservation, water efficient garden, wetlandsLeave a comment on Birds At an Aquatic Habitat: What Changes Could You See After Storms? Everywhere you go, flowers are blossoming! In the mountains, on the plains, around the corners of our neighborhood, they offer so much beauty and charm of the nature. Among them, these two flowers probably catch your eyes quite a lot: the tall Matilija Poppy (Romneya coulteri), and the splendid, golden California Poppy (Eschscholzia californica). Together, they are a tale of two flowers. In 1893, the California State Floral Society met to vote on the state flower of California. There were 3 contenders: the Matilija Poppy, the California Poppy, and Mariposa Lily. All native to California. 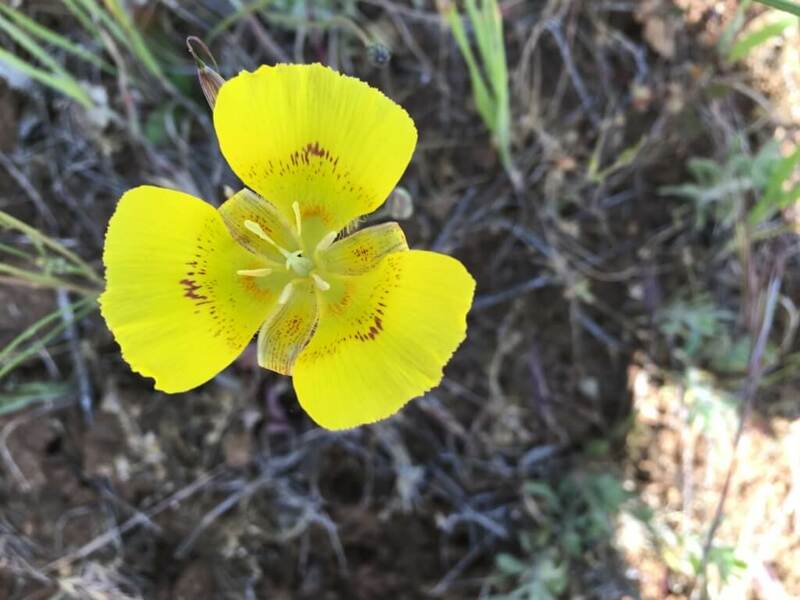 The result: California Poppy received all the votes except for 3, which went to Mariposa Lily. 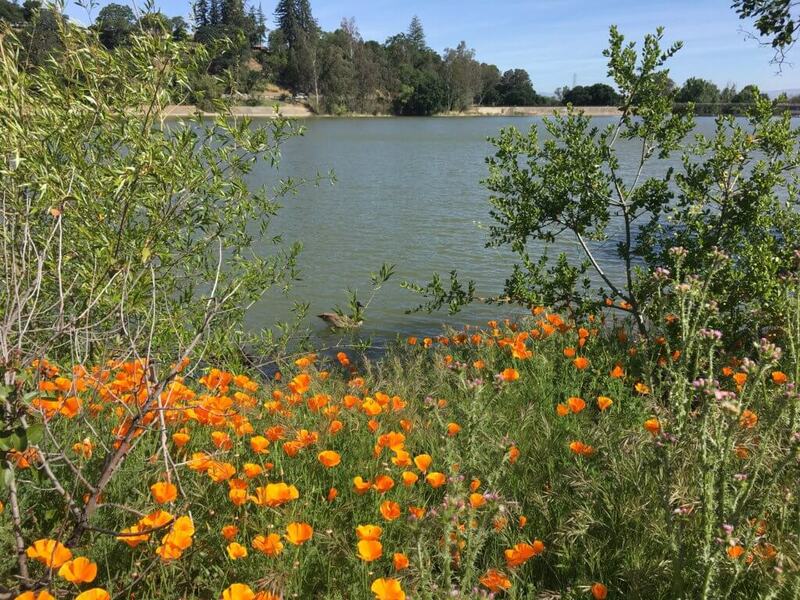 The California Poppy was determined to be California’s state flower. A decade later, in 1903, legislature made the title official. 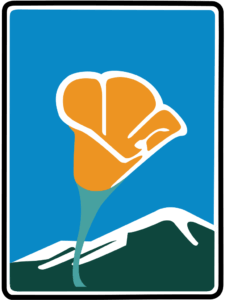 Here is a California Scenic Highway sign with the California Poppy. 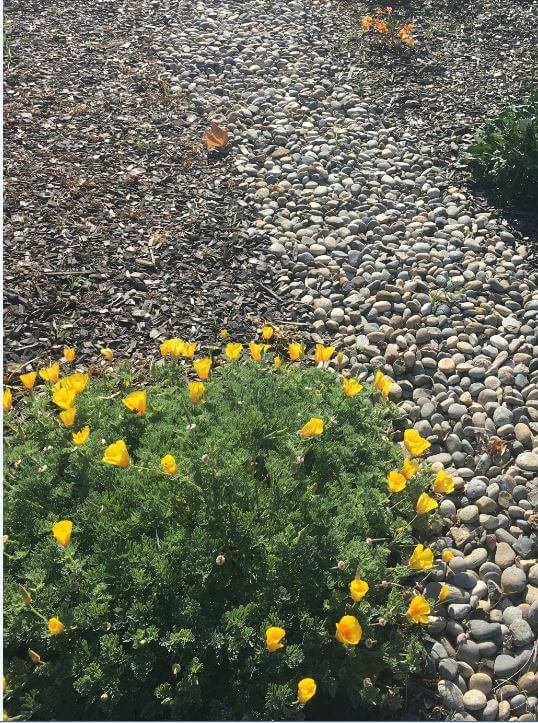 Both Motilija Poppy and California Poppy are beautiful California native plants that are drought tolerant, making them great choices for a water efficient garden. Matilija Poppy is native to dry, sunny environments in Southern California and Baja California. The flower, like a fried egg (“Fried Egg Flower”, another name of Matilija Poppy) is one of the biggest of any species native to California. The flowers usually begin from early spring and can last until late summer. 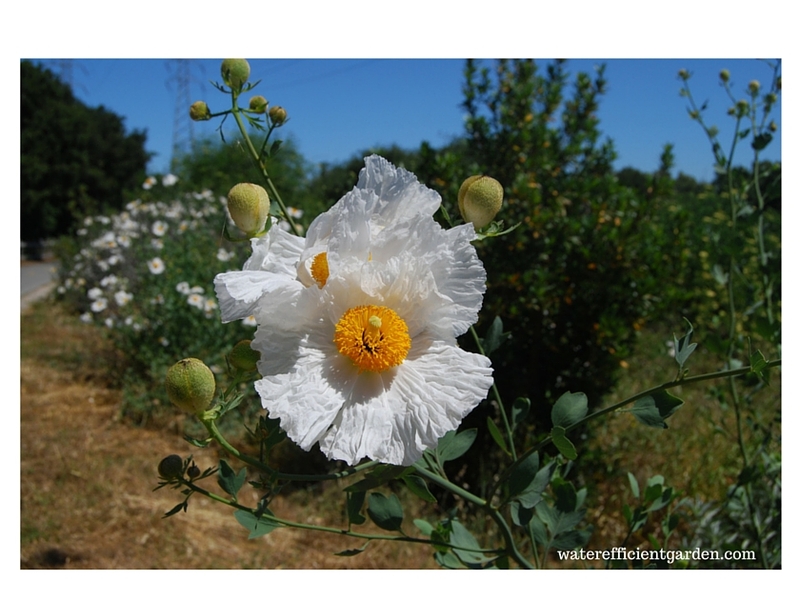 Matilija Poppy is tough and very drought tolerant, can survive in most of the soil conditions. It can grow to be 7 feet tall and 28 feet wide. If there are some spaces needed to be filled in the garden, the Matilija Poppy can be a good contender. 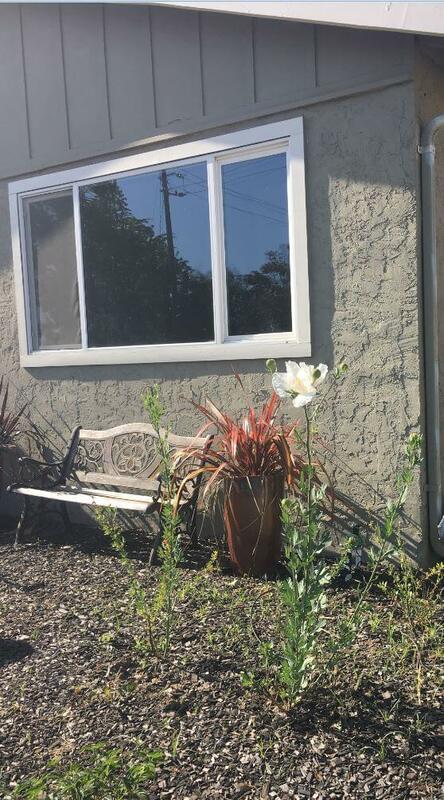 In this garden, the Matilija Poppies are planted near the window. When fully grown, they can become a shield for privacy and hot sunlight. The California Poppy is 4 to 12 inches tall. 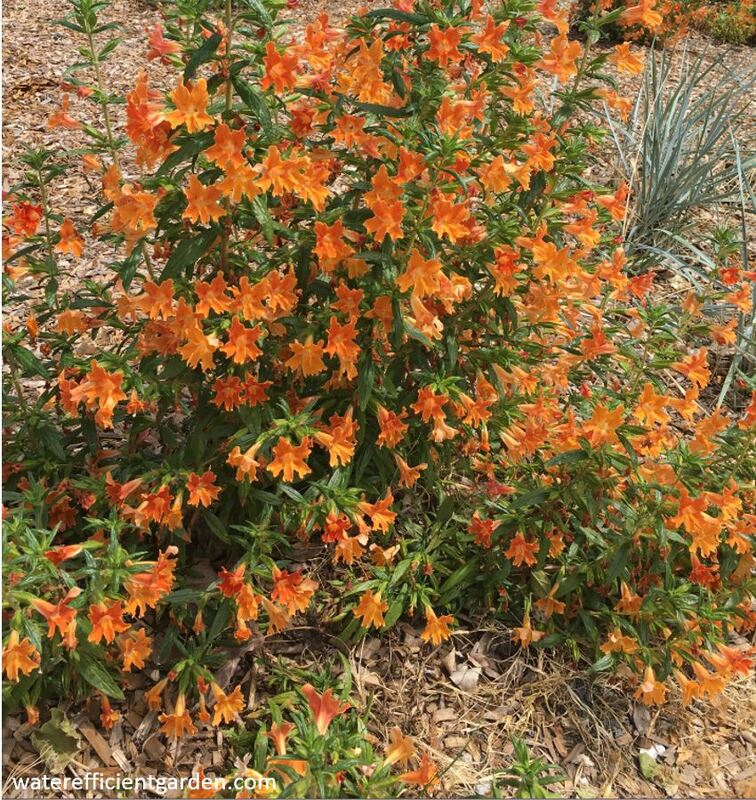 They bloom in spring, adding their bright golden or yellow color to any garden. It is drought tolerant and easy to grow. 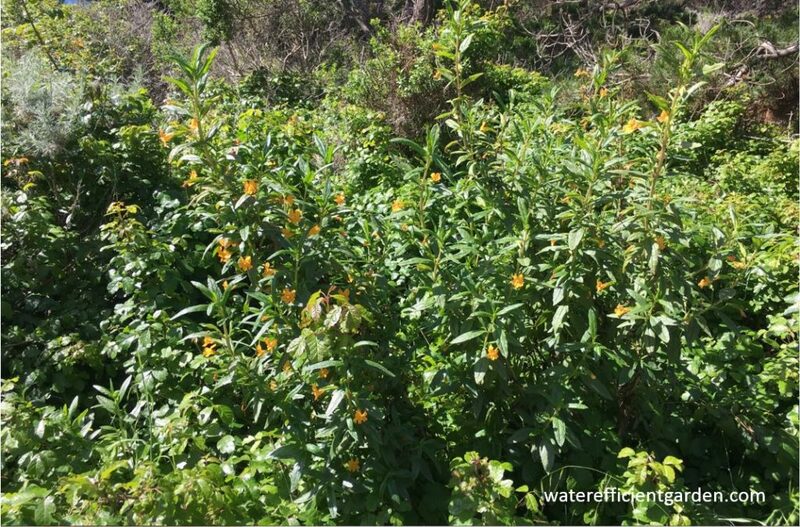 Here, the green foliage and yellow flowers decorate the dry creek bed of this water efficient garden very nicely. 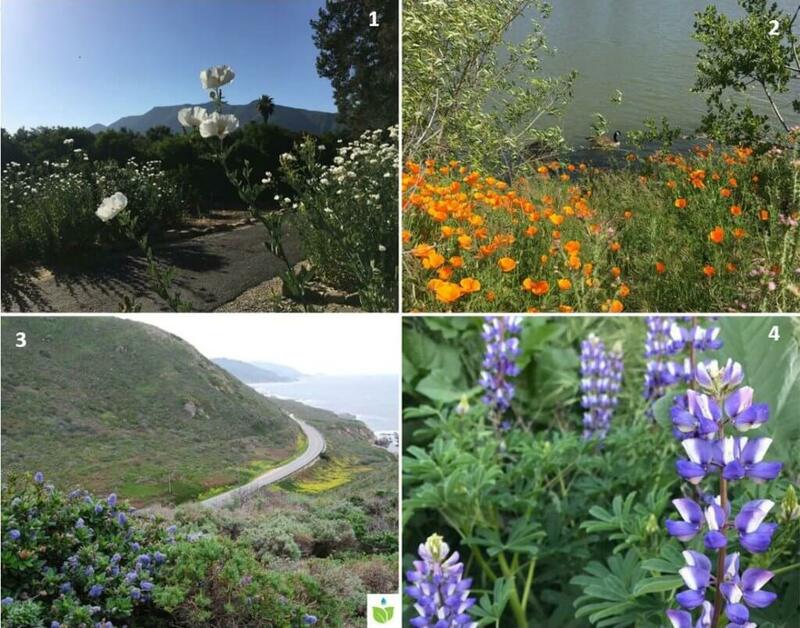 Now you have a chance to vote on your favorite California flower. These 4 flowers are all California natives. In addition to the Matilija Poppy and California Poppy introduced above, the other two are California Lilac (Cean0thus) and Lupine (Lupinus). They are all drought tolerant plants great for a California friendly garden. After experiencing one of the worst droughts in the state’s history from water year 2011-2016, California went to another extreme since the start of water year 2017, receiving so much rains that it became one of the wettest for the time period so far. 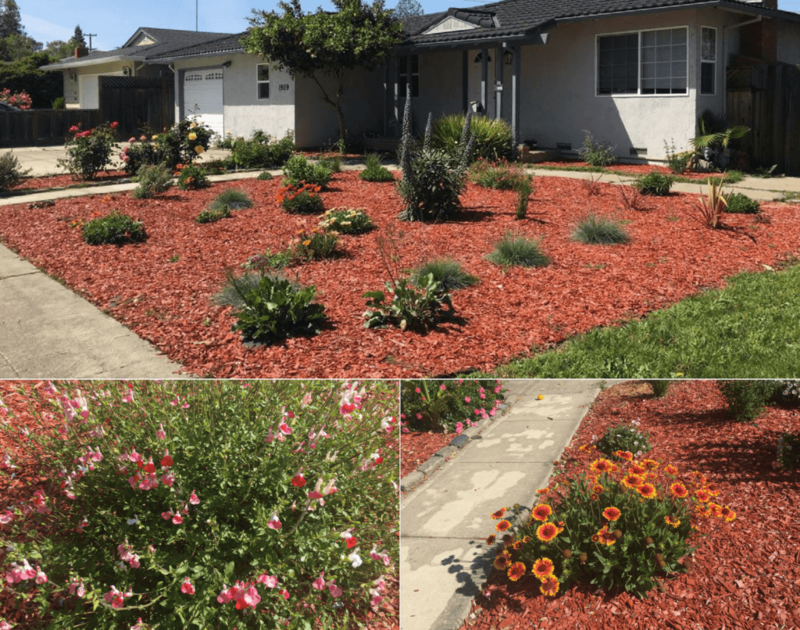 We know generally plants like rain, but how about the drought tolerant plants and native plants that were planted in water efficient gardens last year? Did they survive? How do they do after all the rains? Recently I went back and checked on those gardens, what I saw totally blew me away. A floral dream is blooming! Apart from Echium, other plants also grew and bloomed beautifully. 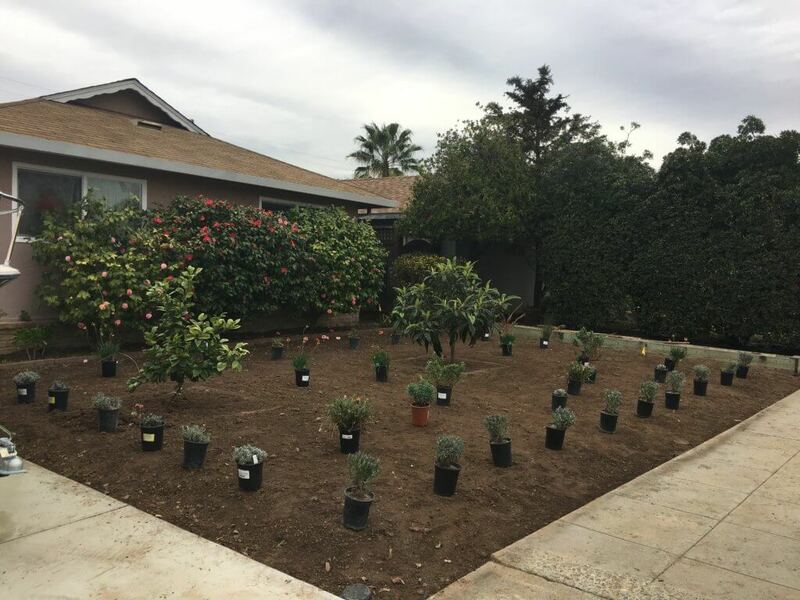 While most of the drought tolerant plants are tough and can thrive in new environments, without a doubt, the heavy rains in the last winter and spring helped them grow so well as they did. 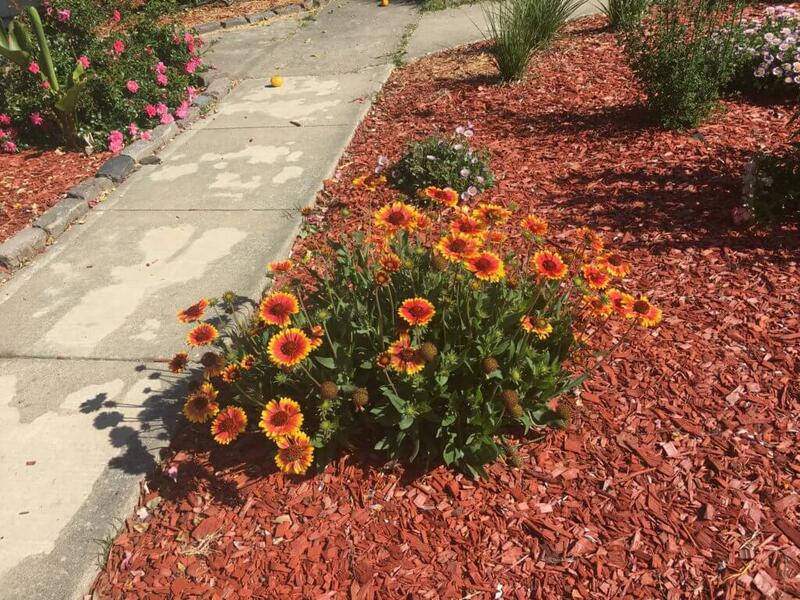 One might ask, since these plants are drought tolerant, why are the rains still so important? 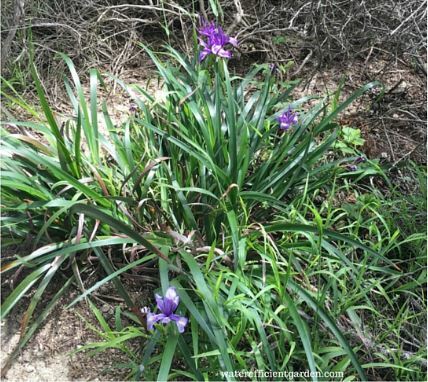 Yes, it is true they adapt to dry conditions and can survive in a low water environment; however, most of them would still like a certain amount of water to bloom, or bloom well. If it was dry in the last season, they can still live, but likely not produce such splendid blossom. For plants like Echium and Seaside Daisy (the purple flower above), which originate from areas of Mediterranean climate (Canary Island and California coast), they are accustomed to rains in winter and very little to no water in summer. They will grow rapidly in the rainy season, then go dormant or grow slowly in the dry summer season. It is amazing how we can observe the same wonder of nature in our garden. In addition to providing us with a beautiful view of all the blooming flowers, water efficient gardens like this can conserve a lot of water. Compared to a lawn, such a garden can save water by 15 to 40%. Yes, with the heavy rains, California is out of the 5-year drought. However, with population growth and climate change, water the resource will just become scarcer relative to its demand. 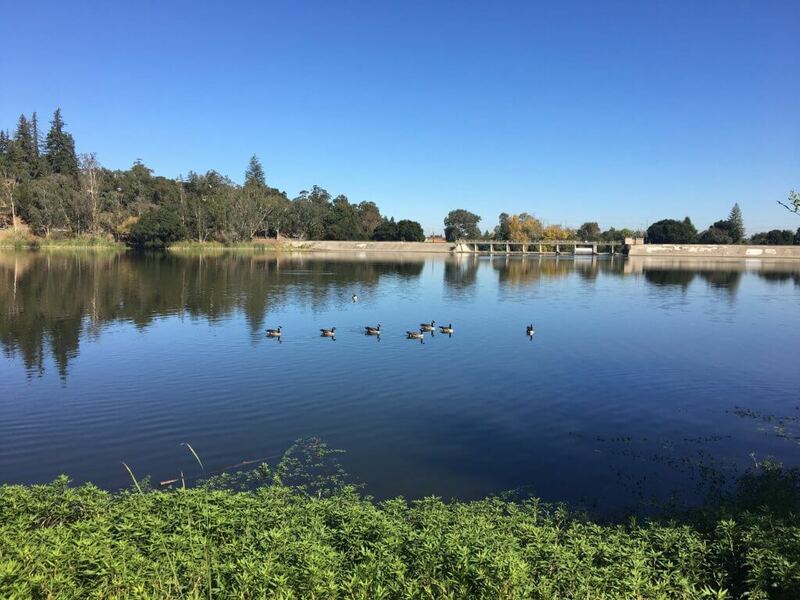 Water conservation is a way of life in California. By building a water efficient garden, one not only can live in such a way, but enjoy all the beautiful views from the many blossoms nature has to offer. Against a full wall of Camilla trees, Lucy (not her real name)’s lawn used to be green and lush. With the drought, however, parts of the turf just went bare, with the remaining thin and weedy. Then rains – lots of them- came, the turf just turned into this big bed of wild weeds. Lucy had been wanting to replace it with a much nicer “dream garden”, but with her really busy schedule, she did not even have the time to think about it. After Lucy heard about the Santa Clara Landscape Conversion Rebate Program, especially the way her project will be done, i.e., all the paper work will be handled, the project will cover the entire process of design and installation, the only time she needed to be involved was the design of the garden – she happily got on board. To apply for the Rebate Program, a pre-inspection was scheduled. At the end of pre-inspection, the application forms were provided. For the application, the filled forms, along with the design of the garden were to be submitted. 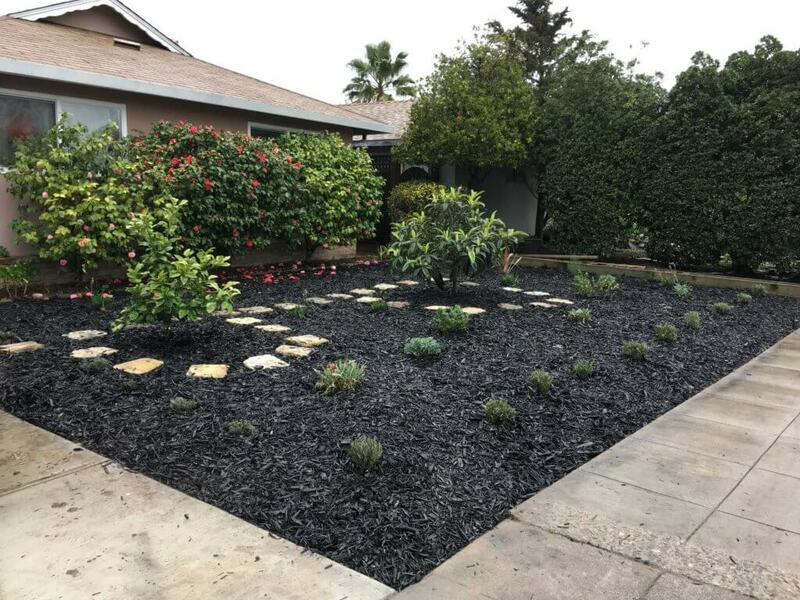 This will be a water efficient garden, meeting all the requirements of the Rebate program, i.e., using only native or drought tolerant plants, using drip irrigation, applying mulch, etc. The next consideration was the look. There was a wall of the camellias at the back of the front yard; in addition, two small fruit trees in the middle. The camellias were in their full blossom, sporting bright pink and red colors, against thick green leaves. It was a beautiful view. A good design should add to the view, not take away from it. 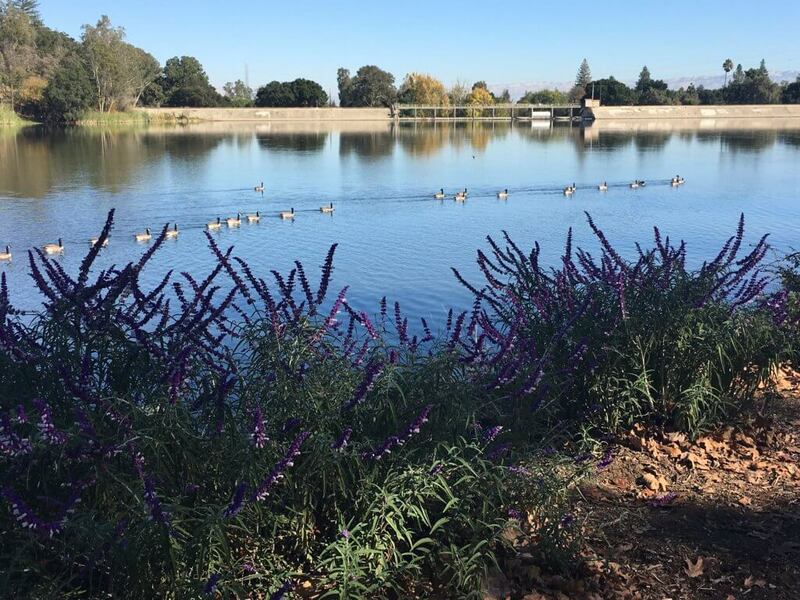 At the time of plant selection, when Lucy spotted a picture of a lavender, she cried “that is it!” A path with lavender on both sides, with its strong scent – that was something of a dream for her. Very luckily, lavender is one of those low water-use plants that qualify for the rebate. Now she could have her dream realized! The application was submitted with the garden design. After a week or so, the Notice to Proceed was received. The project could kick off now. 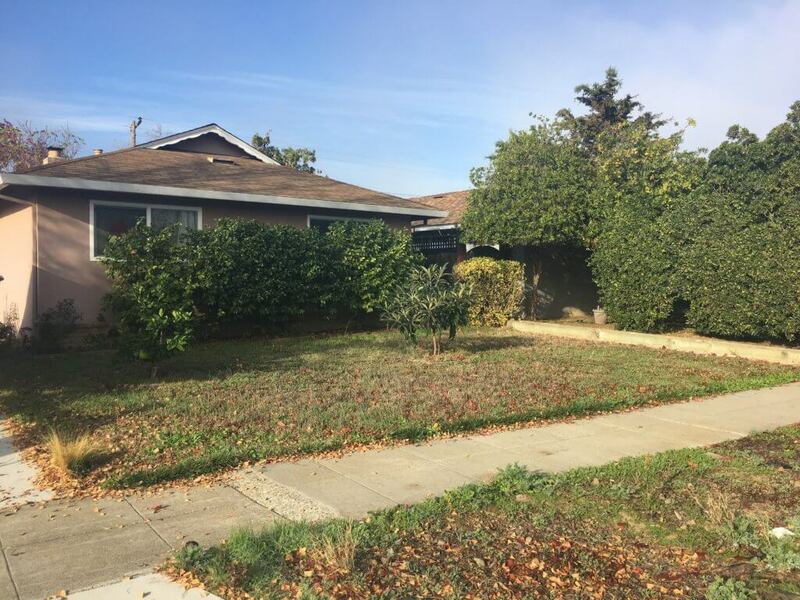 The weeds and turf were removed, plants purchased and placed. 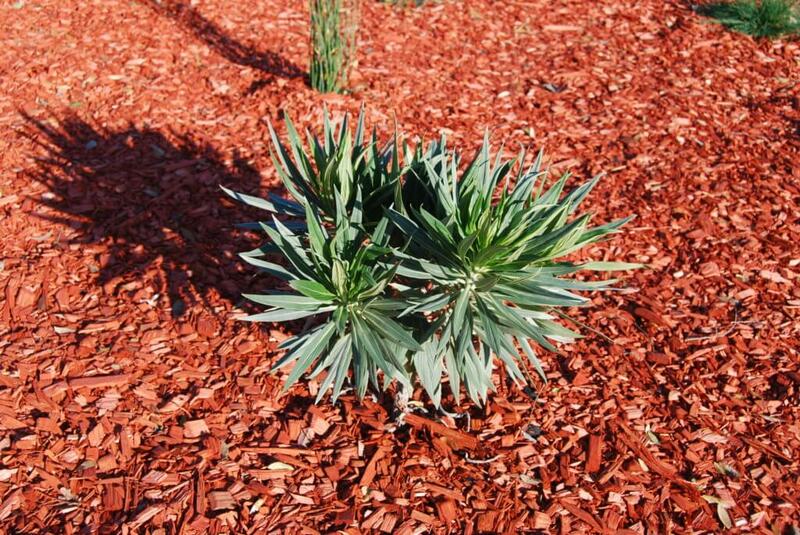 For mulch, it was bark chips, which came in different colors. 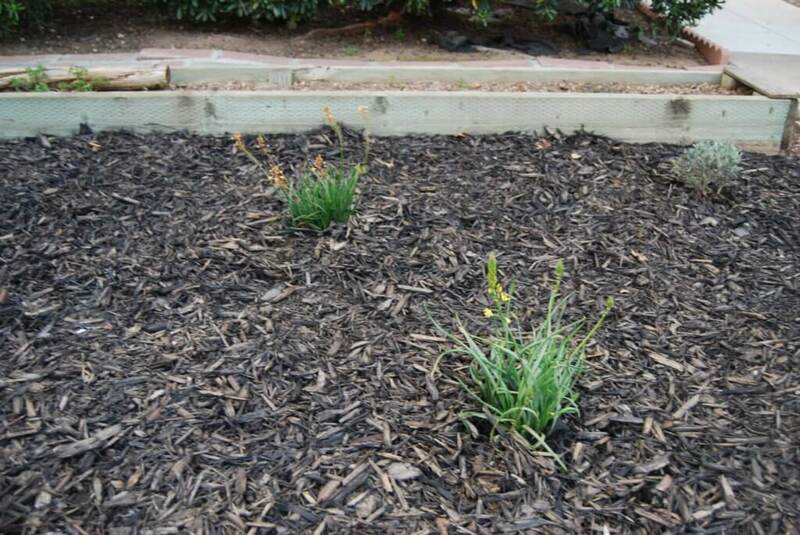 The mulch can effectively prevent evaporation and keep the soil moist longer. When the chips decompose, it can add to the organic matters of the soil, improving the its quality and water holding capacity, which in turn will save more water. Lucy chose the black color, which turned out to be a great choice. The clean design and black surface from mulch make the Camilla’ colors really “pop” out. The light step stones surrounding the two small trees in front not only provide something very functional, but accentuate the trees and add liveliness to the garden. These plants dot the garden space with colors and textures, without distracting from the main view of Camilla. 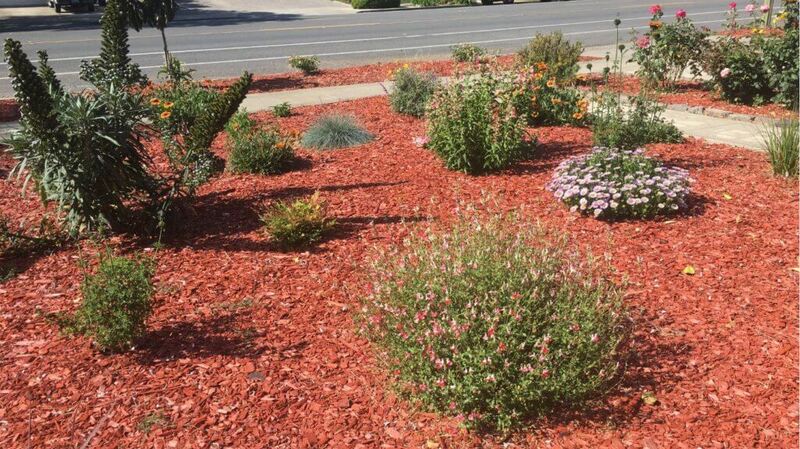 They are all drought tolerant and qualify for the Rebate program. While the garden already looks nice, there is more to look forward to. When the lavenders grow up and fully bloom, walking in the middle will be like walking through a purple corridor with that wonderful lavender scent. Now that is something to wait for! 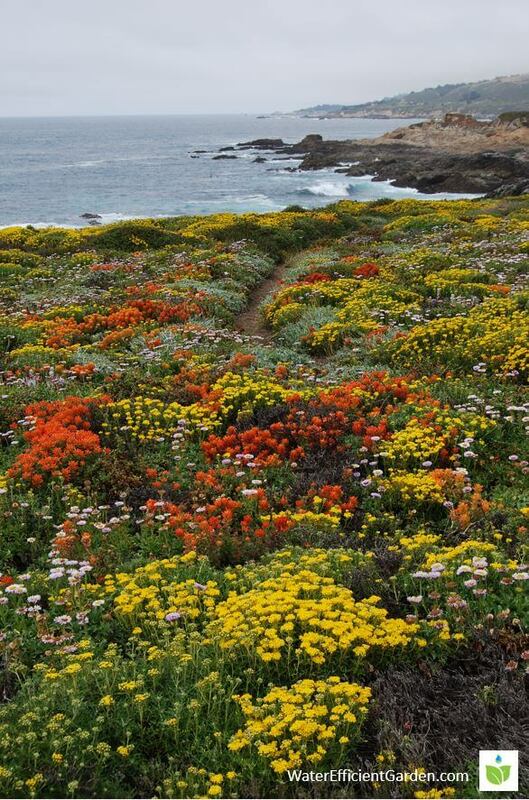 Wild flowers are in full bloom on Pacific Coast! Look at the fields full of wild flowers – what a beautiful view! Native plants grow and thrive in hard coastal environments that are very cold, windy and dry. When spring and summer come, they will all go into full blossom, turning the field into a huge colorful blanket. Here is the good news – you can plant a lot of these native plants in your garden, so you can enjoy the same blossom from the comfort of your home. 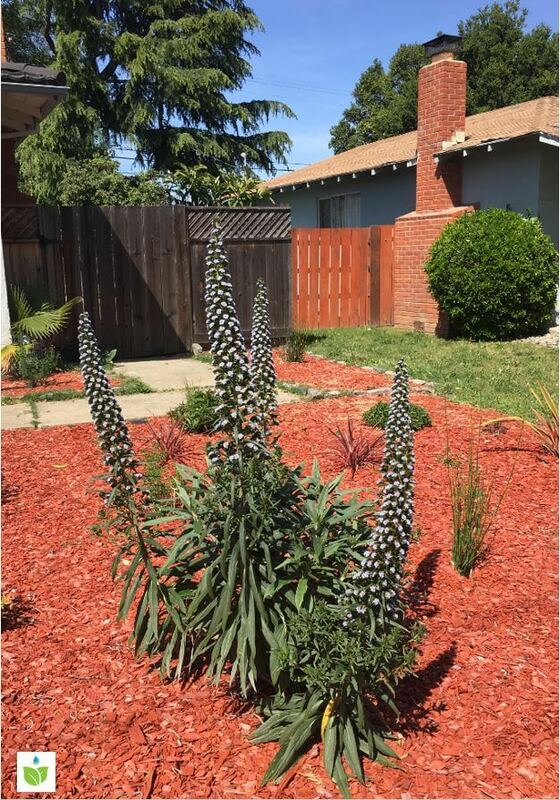 In fact, you are encouraged to plant them, as many of them are drought tolerant, and qualify for Santa Clara Water District’s Rebate Program. The beautiful yellow and purple flowers in the photo are two such plants. 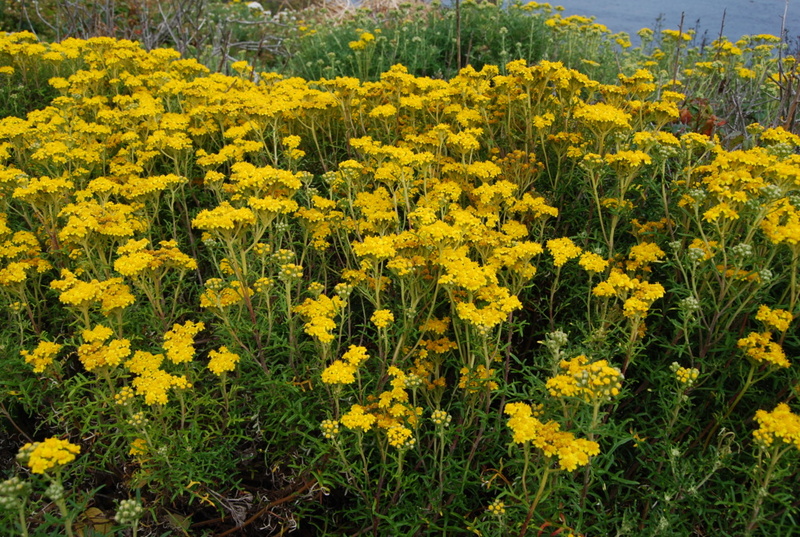 Native to California, this perennial plant (Eriophyllum confertiflorum) is well adapted to dry and windy coastal climate. Very hardy and drought tolerant, you don’t need to water much after they establish. The golden color is lovely! 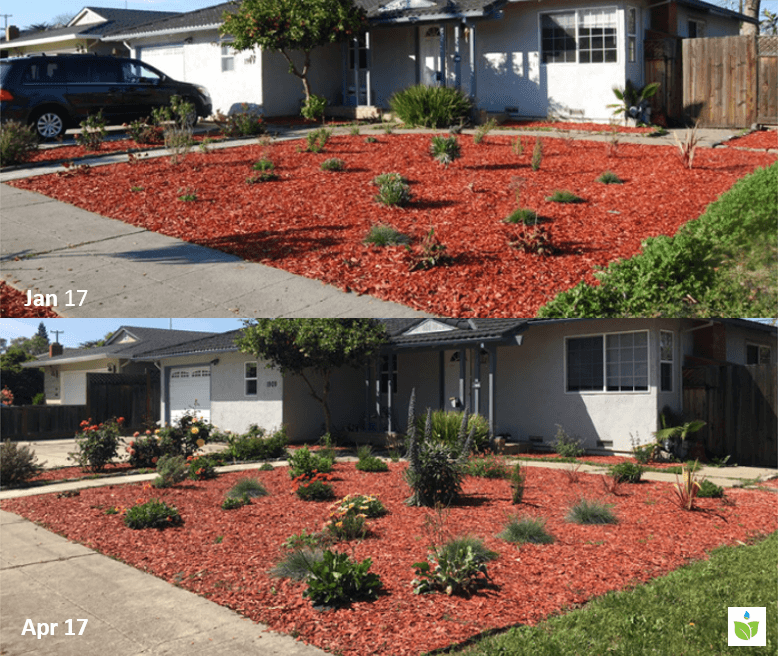 Qualifies for the Santa Clara Water District’s Landscape Rebate Program. 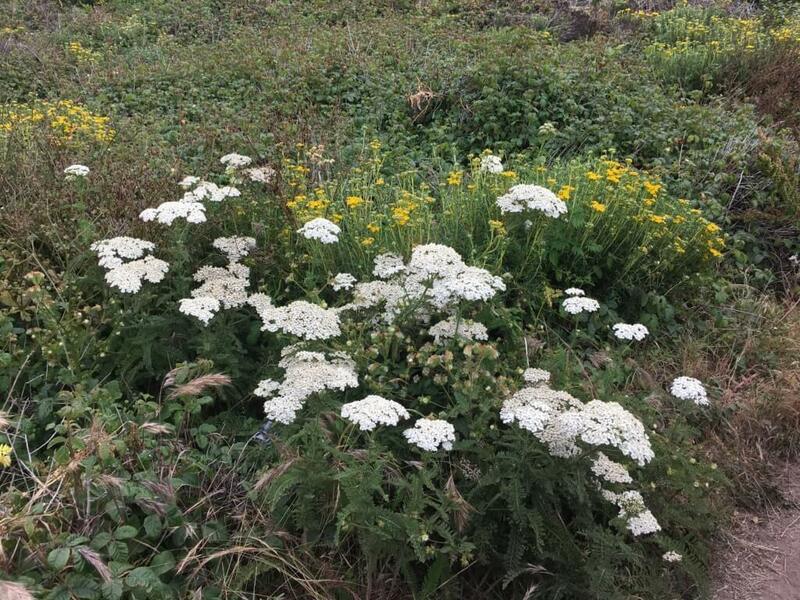 In addition to Golden Yarrow, the white-flowered yarrow also grow and blossom in abundance in the same place. This kind of yarrow is called Common Yarrow (Achillea millefolium & hybrids). 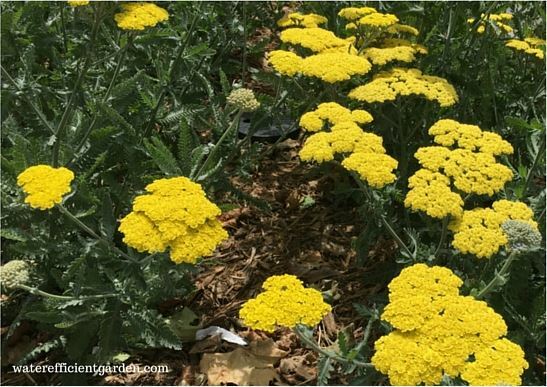 Just like their sister Golden Yarrow, they are also native, very tough and drought tolerant. Another great choice for a garden. 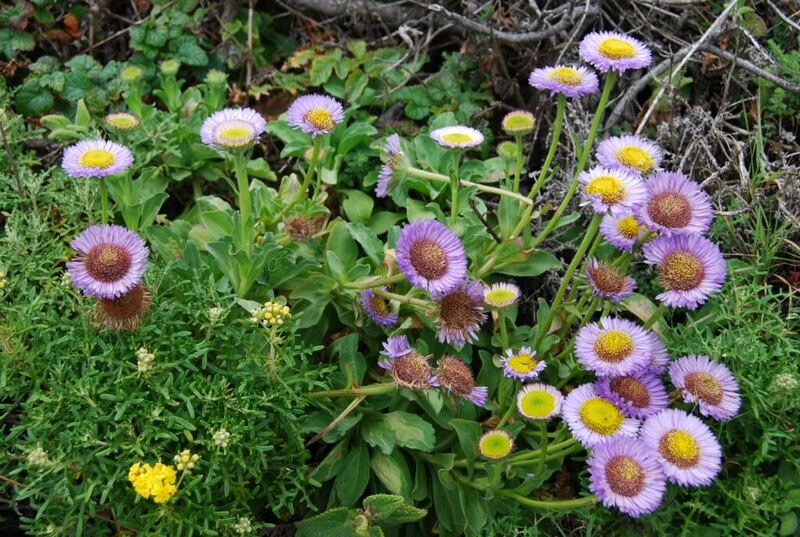 As its name indicates, this perennial plant ((Erigeron glaucus) is native to the seaside areas on West Coast. 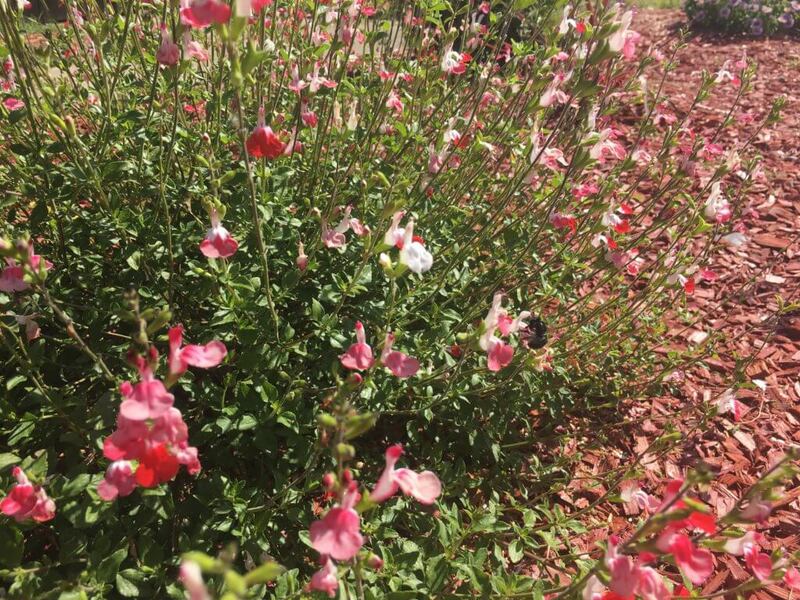 Tough, drought tolerant, it blooms for a long time (spring to late summer). It can grow to be 1 feet tall and 2 feet wide. A great plant for a water efficient garden. 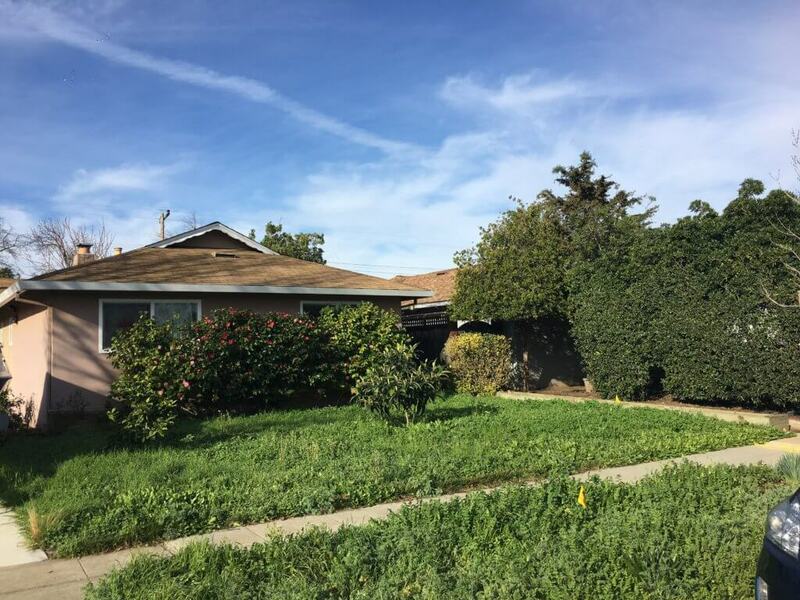 Qualifies for the Santa Clara Water District’s Landscape Rebate Program. 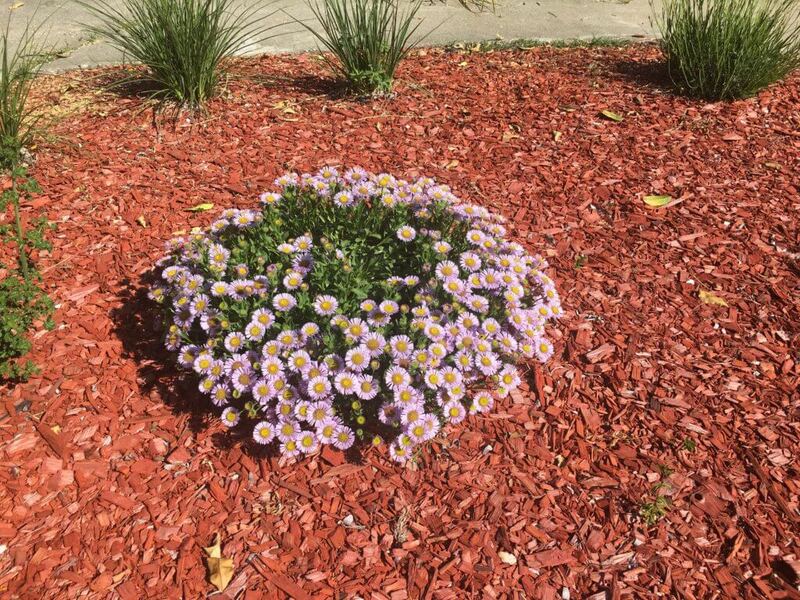 A garden with the seaside daisy. 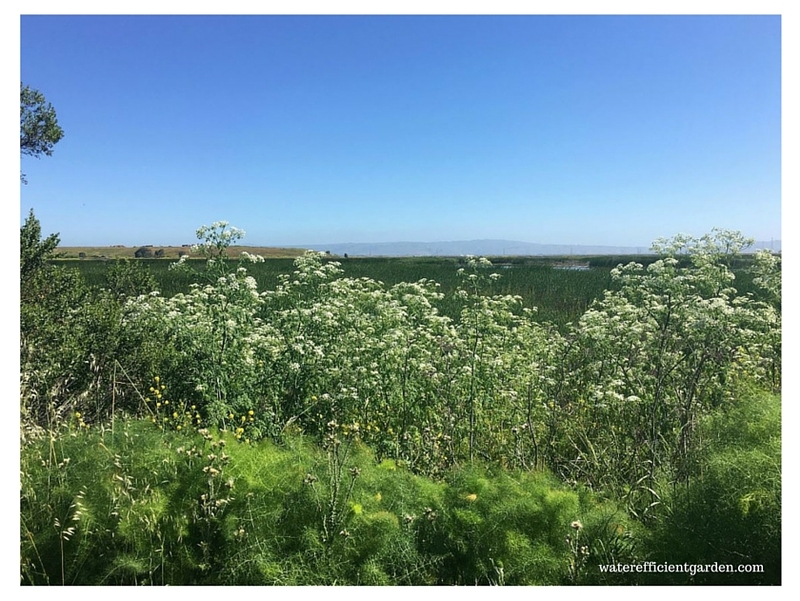 If you go for a hike in one of the state parks or nature preserves in northern California now, chances are, you will see blossoming wild flowers. 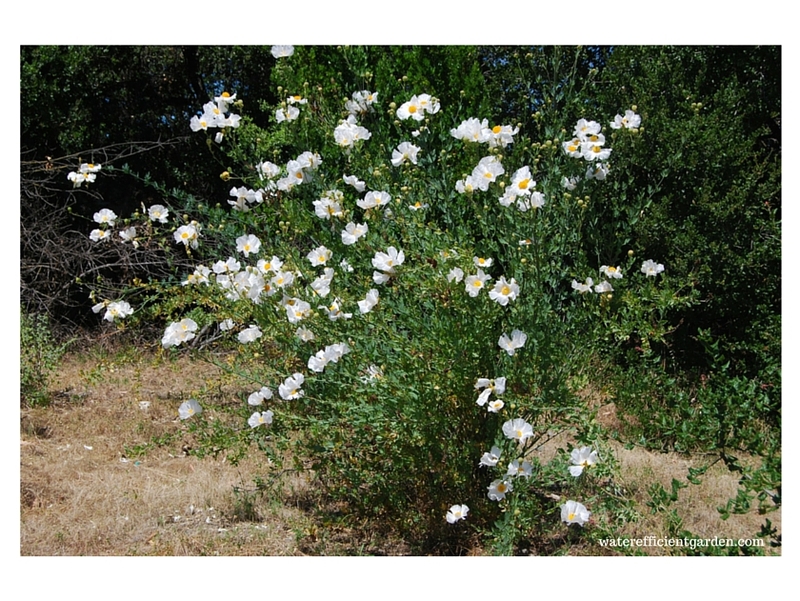 They can be as tall as a tree (Matilija Poppy), or as small as a daisy. Standing with flowers of all the different colors and shapes, they make spring come to life. Wild flowers under blue sky – one of the most beautiful scenes you can see in nature. Attracting butterflies, birds and bees: they sure like the food from the plants that they know well, and you can view them often in addition to the beautiful blossoms. The native plants below are excellent choices for a garden. 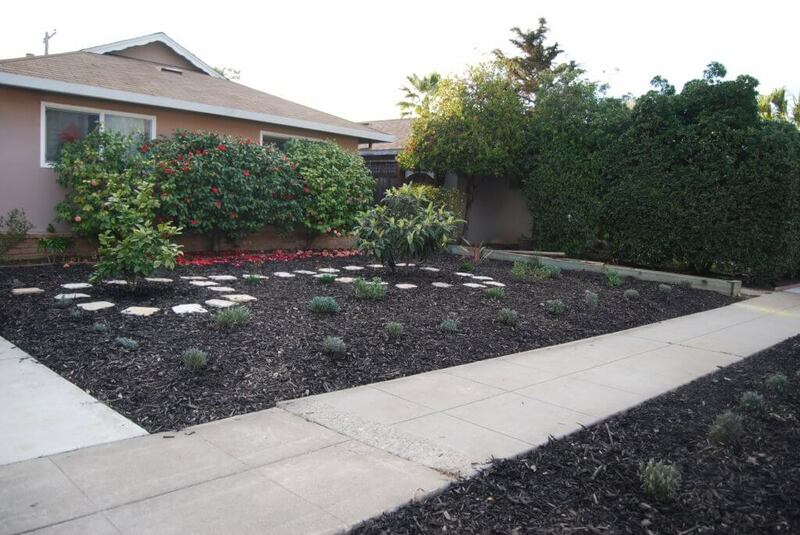 They are all water efficient plants and all qualify for Santa Clara Water District’s Rebate Program. What does the flower look like to you? That is right, a fried egg! 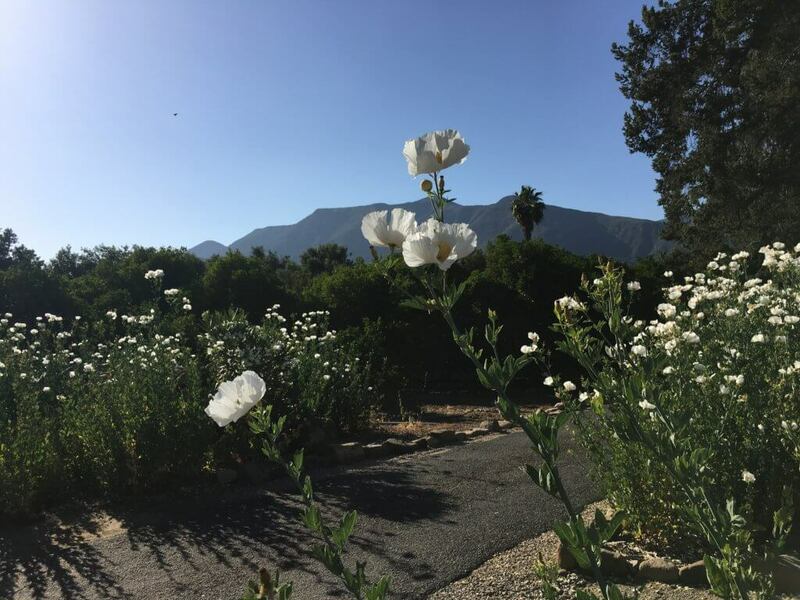 Also named Fried Egg Flower, Matilija Poppy (Romneya coulteri) is native to dry, sunny environments in Southern California and Baja California. The flower is one of the biggest of any species native to California. Matilija Poppy is very drought tolerant. It can grow to be 7 feet tall and 28 feet wide. The flowers usually begin from early spring and can last until late summer. 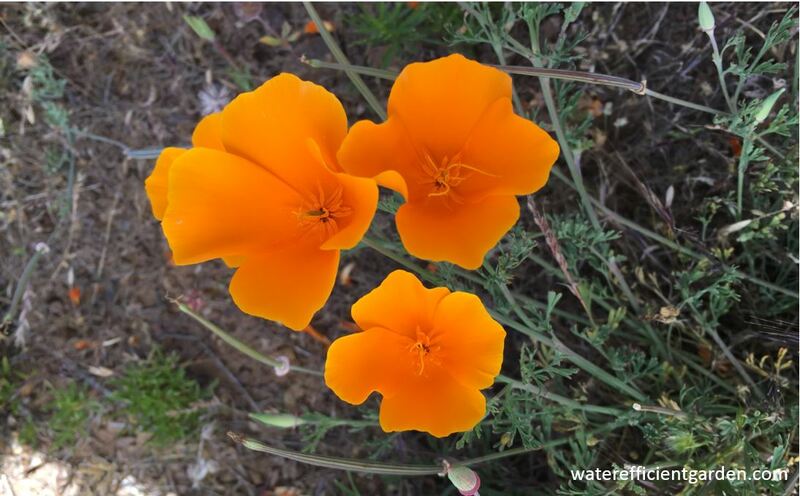 When spring comes, the bright color of California Poppy (Eschscholzia californica) lights up hills and open spaces throughout California and other western states. 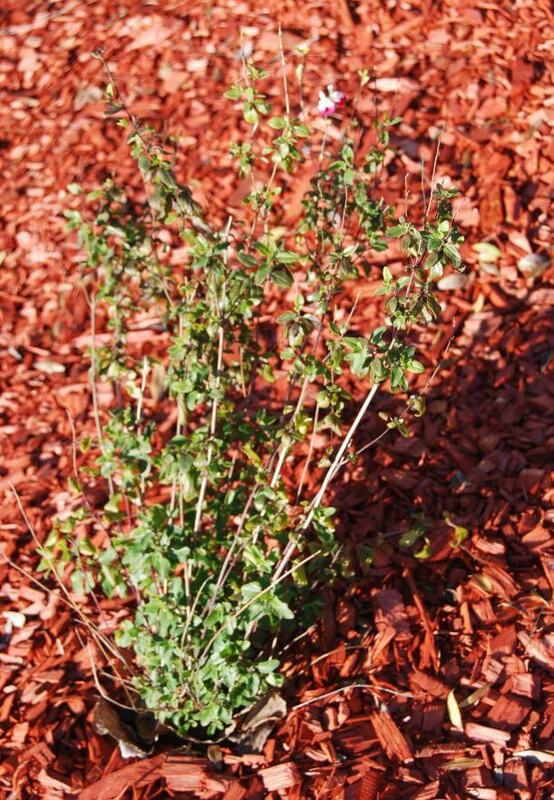 Easy to grow, drought tolerant, and that golden color – this plant is ideal for a water efficient garden. 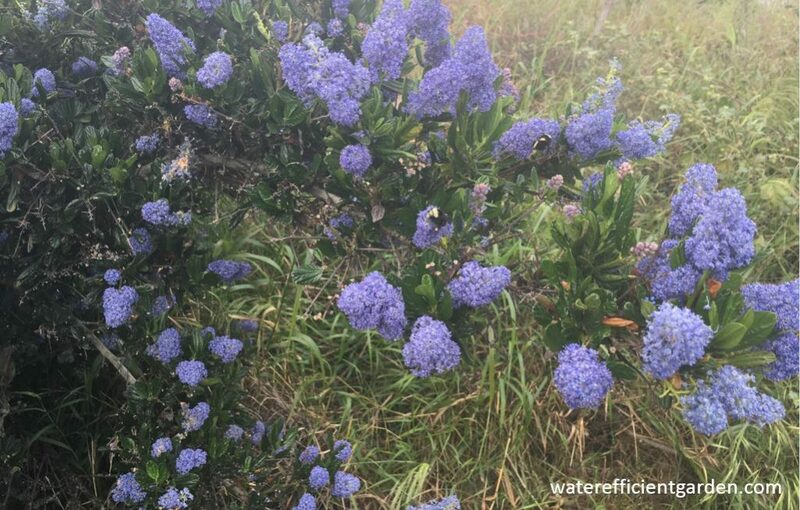 This shrub with dense blue flowers ((Ceanothus spp.) 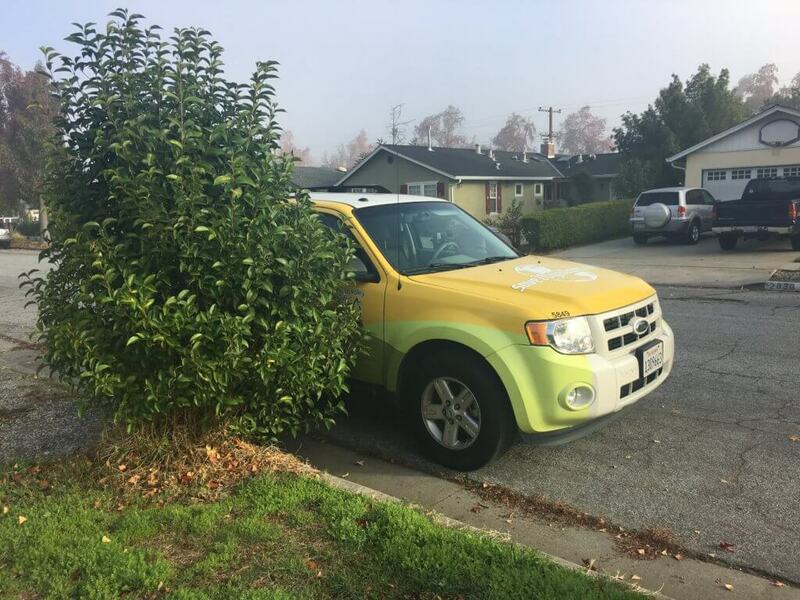 can be seen everywhere in California. It is very tough and drought tolerant. It can grow to be 4-6 feet tall. Monkey Flower (Mimulus spp.) is a perennial plant native to the west coast areas from Southern Oregon all the way to Baja. It can grow to be 5 feet tall. In flowering season, the whole plant can be covered with golden blossom, which makes it really stand out. It is quite drought tolerant. 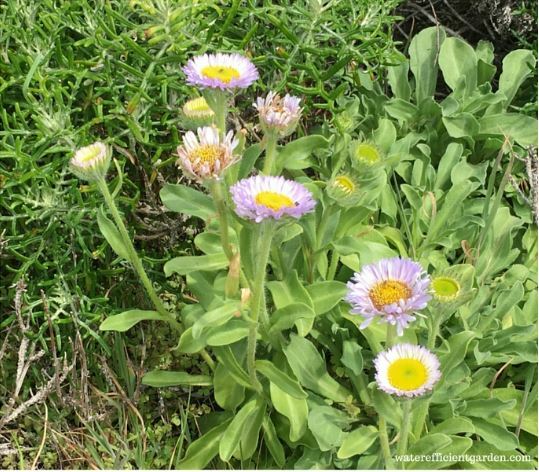 As its name indicates, this perennial plant ((Erigeron glaucus) is native to the beach areas on the west coast. Very hardy and drought tolerant, it doesn’t need any care once established, yet flowers for a long time (spring to late summer). It can grow to be 1 feet tall and 2 feet wide. This is a great choice for gardens on the west coast. The plant with the beautiful flower is native to areas along west coast. Very easy to care, quite drought tolerant. It can grow to be 2-3 feet tall. Another great choice for a water efficient garden. 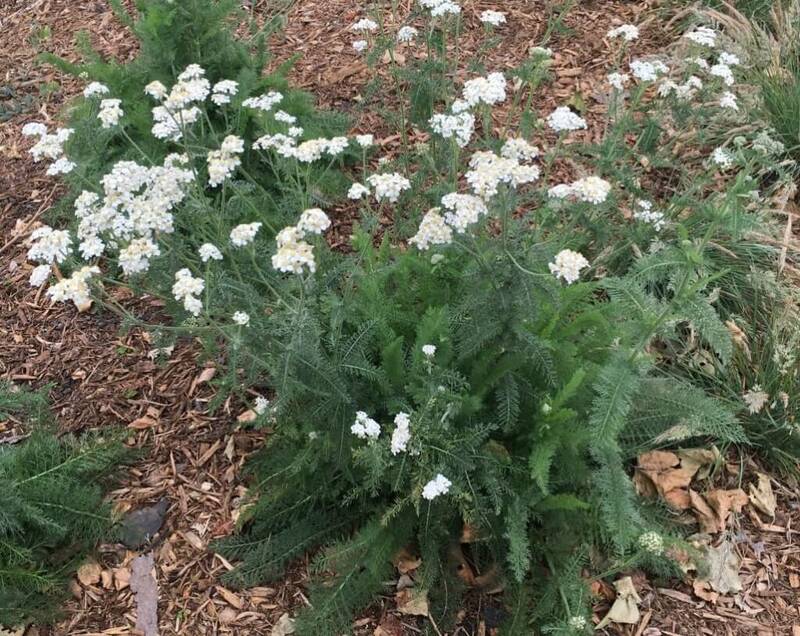 This perennial plant (Achillea millefolium) is very easy to grow and drought tolerant. There are different varieties, with white or yellow blossoms. They can grow to be 1-3 feet tall and 2-3 feet wide, depending on the variety. They are aromatic and attract butterflies.